This page is a work in progress due to lack of documentation from previous years. We are doing our best to update! Our 2017 robot was able to effectively score its preloaded gear during the autonomous phase thanks to a well-tested vision tracking system. Sauron’s name comes from the ring of LEDs shining balefully above its gear hopper. 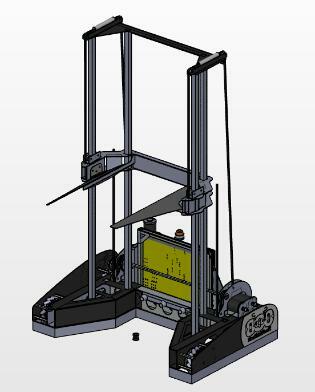 An isometric view of Jenga's final CAD model in SolidWorks. An image of Jenga's drivetrain. Jenga in the pits at competition. Jenga on the field at competition, arm raised. Jenga is our 2016 competition robot. 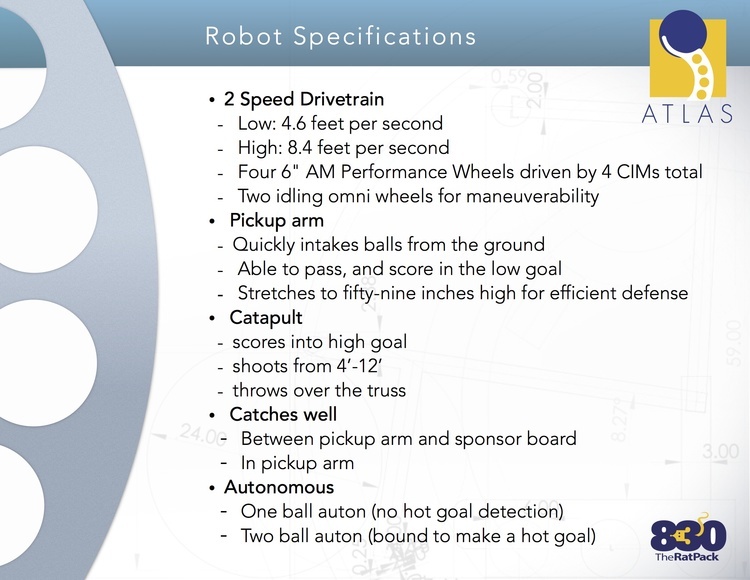 It is a robot designed to be able to cross most of the obstacles presented by First Stronghold and is able to shoot for both high and low goals in the game. Its arm raises out of the chassis and shoots to the perfect height when lined up against the tower. 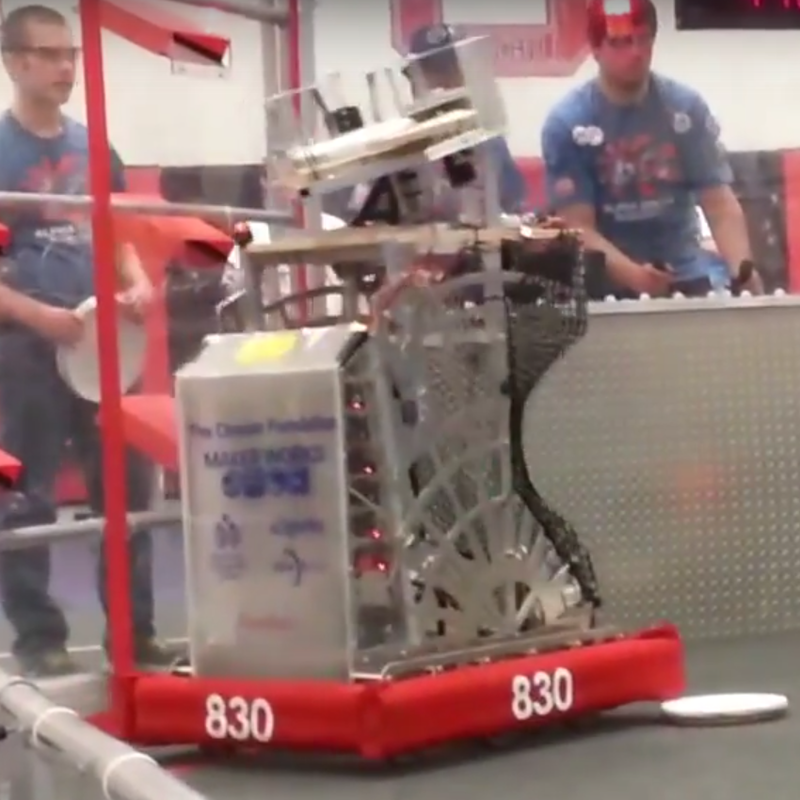 FIRST Stronghold was the 2016 FRC game. It required robots to cross through different defenses, such as doors or different types of terrain, and to shoot boulders into the opposing alliance's tower to 'destroy' it. Jenga aimed for the high goal, as we were able to design the robot to drive up to the tower and shoot from there. However, Jenga is also capable of crossing over almost all of the defenses without fail. Black Knight in its final CAD model. Black Knight at the 2015-16 Intro Meeting. 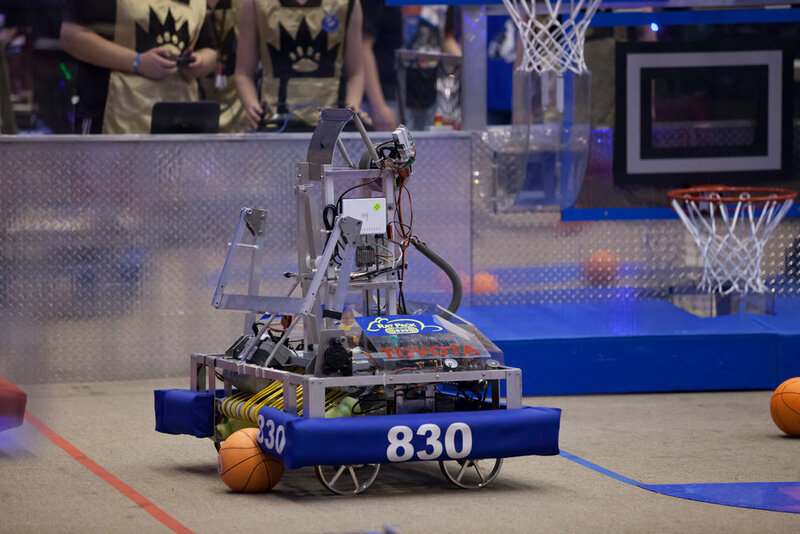 Black Knight was the 2015 competition robot. It is a robot designed to be able to pick and stack totes up to six high along with adding a recycling bin onto the top of the stack and be able to deal with fallen totes and pool noodles in the way. A recycling themed game that called for alliances of three robots each to stack totes and cap them with recycling containers, and to place pool noodles in these containers. In line with the nature of the game and its theme, all of the parts and game pieces used in the game were chosen specifically because they were reusable for teams, volunteers, and FIRST coordination teams alike. A CAD model of Bolt. A CAD model of Rivet. Rivet concept by D. Earle. Rivet concept v1.1 by K. Gilbert. Rivet concept v2.1 by K. Gilbert. Rivet concept v3.0 by K. Gilbert. Rivet concept by D. Neamati. The laserbots were a summer project that consisted of two robots, Rivet and Bolt - Rivet had a sharper design, and Bolt was much smoother in design. Each bot were planned to incorporate parts of laser tag guns to detect one another, and controllers were designed so that the two bots would 'fight' using these components. Lights on the bots would indicate robot 'health', and the lasers would be used as, well, lasers to lower said health. Sadly, these bots never made it far past the design stages due to a variety of issues. Atlas in its final CAD model. Atlas being worked on during the Build Season. Atlas being displayed at MakerWorks. 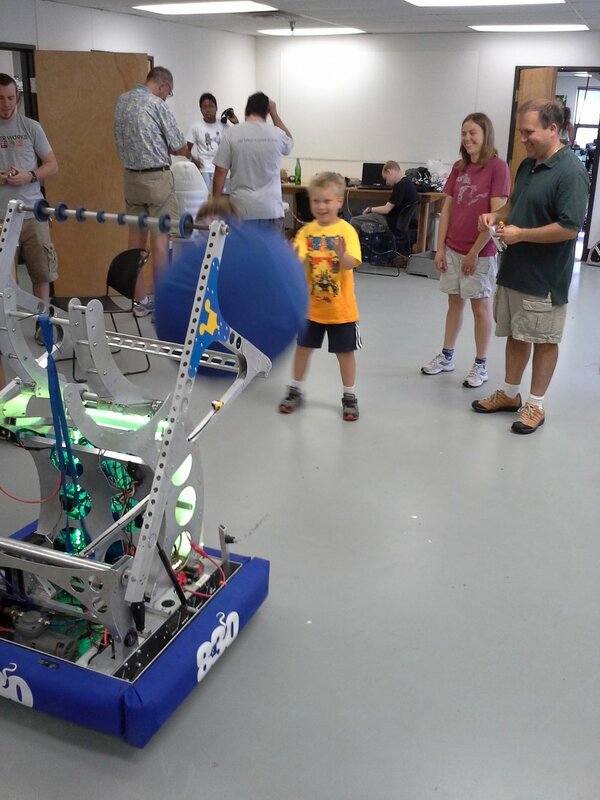 Atlas was the 2014 competition robot. Zoidberg at the 2012 Worlds competition. Zoidberg was the first robot built in our new location at Maker Works. 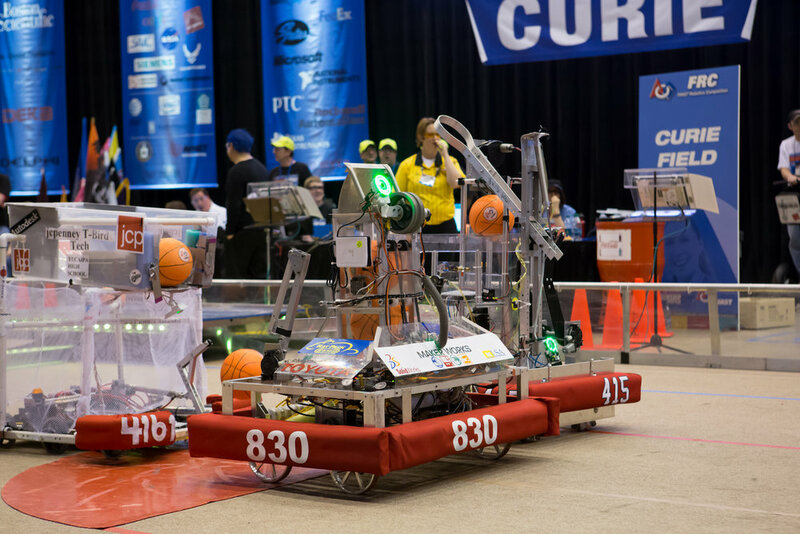 This robot won the 2012 state competition along with teams 469 and 67, and took the teams to the world competition in St. Louis. The 2006 robot at Waterloo. The 2006 drive team carrying the robot off the field. Alliance selection at Waterloo Regionals. Not much is known about this robot, aside from its historic value! This would have been our team's fifth season.